Introducing the all-new 2020 Kia Telluride. With its big, bold styling, Telluride is the largest Kia ever, and with its robust capability, it’s bringing that SUV attitude to the road, and off the road. 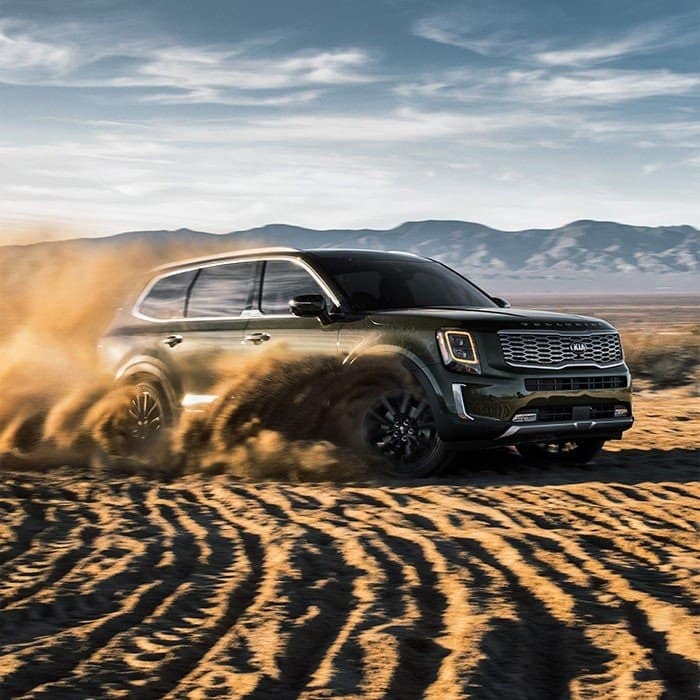 The long-awaited debut of the all-new 2020 Kia Telluride at the 2019 North American International Auto Show has just opened the door for adventure. Specifically designed for the American market, our largest SUV ever features all of the technology, capability and versatility needed to make Telluride a true flagship SUV. With a 291 horsepower 3.8-liter V6 engine, available self-leveling rear suspension and available active on-demand all-wheel drive, exploring the great unknown will be both a thrilling and luxurious experience. Comfort never takes a back seat in the all-new 2020 Kia Telluride. From the available double-stitched, quilted and padded Nappa leather seat trim, to the ceiling mounted climate vents, keeping up to eight occupants in complete comfort is a breeze. See for yourself why Cars.com awarded “Best in Show” to the all-new 2020 Telluride, citing its spacious interior, comfortable cabin, high-end technology, and details and amenities that would be at home in any luxury brand vehicle. Now that you’ve learned a bit more about the 2020 KIA Telluride, it’s time to get back on the road in style! Come in to Steven KIA today in Harrisonburg, VA. Also serving Staunton, Charlottesville, VA and the surrounding areas. We look forward to seeing you! The Kia 10-year/100,000 mile warranty program* consists of: 10-year/100,000 mile limited powertrain warranty. 5-year/60,000 mile limited basic warranty. 5-year/100,000 mile limited anti-perforation warranty. 5-year/60,000 mile roadside assistance plan. Each provides coverage until either the yearly or total mileage figure is reached, whichever comes first.